It’s no secret that LinkedIn is the place to be if you want to attract new clients in the events industry. A staggering 79% of B2B (business to business) marketers say that LinkedIn is a good source for generating leads. With that being said, it’s essential that you present yourself in the best light on LinkedIn and that means sprucing up your profile. No more empty grey avatar profile photo and barely filled out sections. Let’s get your profile looking amazing and ready to attract new high-quality clients to your business. 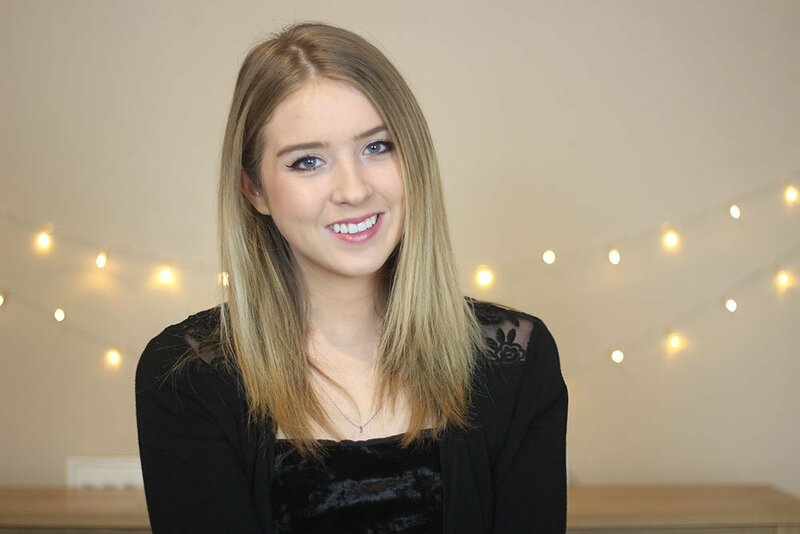 The best practice for LinkedIn profile photos is professional, head and shoulders only and in front of a simple background. Your profile photo can also show off a bit of your personality and make you look friendly and approachable. Don’t leave your cover photo blank. Show off a photo of you at an event or create a free graphic on Canva with a design that best represents you and what you do. Your headline is a snapshot into what you can do for your clients. It’s the first thing they see about you and it is also what the search engines use to determine when and where you should show up in anyone’s searches (on LinkedIn and beyond!). Start by including popular event related keywords in your headline (event manager, venue finder, corporate event manager, etc). Use all of the 120 characters you get and show off what makes you unique. This isn’t a time to be humble. If you have won any industry awards or have been professionally recognised in some way, definitely include this information in the headline! You can also instead include a dazzling description of what you do after the keyword (eg: helping clients find unique venues perfect for their next meeting or event). Here's a great example of a LinkedIn profile based on what we've talked about so far. 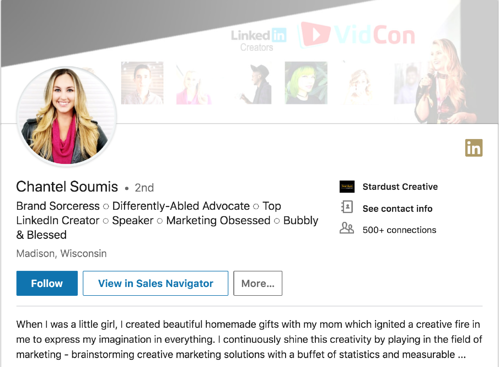 Chantel Soumis is a Top LinkedIn Creator so she knows the art of a great LinkedIn profile. Chantel has a professional profile photo that makes her look approachable and friendly. Her cover photo represents exactly what she does in her career and her headline is informative, unique and keyword-friendly. Your summary is the most important part of your LinkedIn profile. It’s the section your potential leads will read to decide if they want to take the next step with you after making that first connection. Always write your summary in the first person and make it as engaging as you can. Include a story of how you got started in events or why you’re so passionate about them. Use the space to highlight what makes you unique in the industry and how you can help your clients. At the bottom of your summary, include a clear call-to-action that directs people reading to the next steps they should take to work with you. You can include your work email address where they can reach you or a link to landing page on your website that will capture their email address. Many people on LinkedIn treat this section like it’s their CV and just include when and where they worked and some bullet points of their responsibilities on the job. While this is better than nothing, you have an opportunity on LinkedIn to highlight your job experience in a much more engaging way. Don’t just include where you worked and when in the experience section. Add a personalised blurb written in the first person about what you achieved while at the company. Include real stats and figures if you can and add multimedia in the form of images, slideshows or videos showing off your best projects or campaigns. Ask for a few recommendations from people you have worked with to add more social proof to your LinkedIn profile. If you’re using LinkedIn to find new clients, ask for some recommendations from former happy clients. Having someone else shout out to the world about your expertise and the specific benefits you have brought for them will help you land more clients. 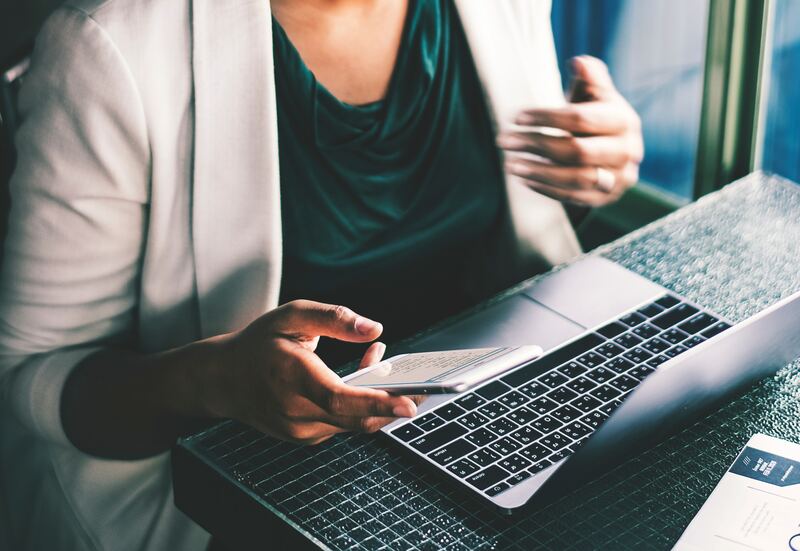 If you’re using LinkedIn for job hunting, asking for recommendations from former bosses or colleagues will serve you well, proving your competency in the events industry and how well you work with others. So there you have it! We hope you found these tips helpful for sprucing up your LinkedIn profile. Let us know in the comments if you have any tips of your own you would like to share.